One of the key objectives of the CENTRE-PD programme is to implement outreach and awareness measures to engage with key stakeholders including not only patients and the general public but also healthcare professionals (WP5: Awareness, outreach and communication programmes). Within this context, the CENTRE-PD programme supports the communication and dissemination of the National Centre of Excellence in Research on Parkinson’s Disease (NCER-PD), an initiative of the Luxembourg National Research Fund (FNR). A crucial part of the communication strategy is organisation of and participation in outreach events in Luxembourg and the Greater Region. If you wish to be informed about upcoming outreach events, follow the Facebook page of the NCER-PD programme. On the 6th of July 2018, the NCER-PD Summer Party hosted NCER-PD participants and their families for the third consecutive year. 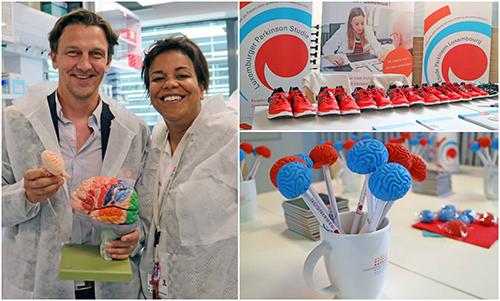 The attendants had the opportunity to visit various labs, check out the booths and take home goodies! We would to thank the participants as well as our partners for helping host the event! The NCER-PD team participated with a booth at the 2018 edition of the CFL event "Journée Sécurité Santé". The aim of the event was to inform the CFL employees on topics related to health and safety at work. 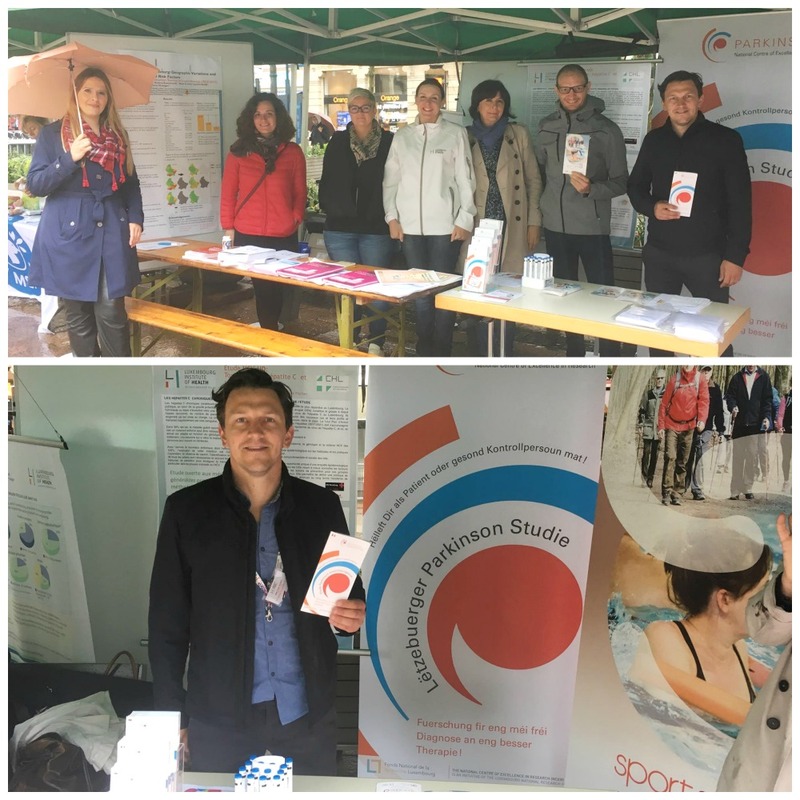 The NCER-PD team had the opportunity to spread information about Parkinson's Disease and the research on it in Luxembourg, as well as to encourage new volunteers to participate in the clinical study. On the 9th of June, the second Giant Public Pillow Fight came back in Luxembourg and took place in front of the Grand Ducal Palace. The event’s aim is to raise awareness about Parkinson’s disease and the research activities of the National Centre of Excellence in Research on Parkinson’s Disease (NCER-PD). Throughout the afternoon, hundreds of visitors could not only join the pillow fights, but also visit the stands such as the booths of the Luxembourg Institute of Health (LIH), which co-organised this second edition, the Centre Hospitalier Emile Mayrisch (CHEM), which created a super-hero drawing campaign, the Parkinson Luxembourg asbl, and the Scienteens Lab. The visitors also had the opportunity to learn more about Parkinson’s disease and its research conducted in Luxembourg. They could try on a Parkinson suit ,which simulates the two most representative motor symptoms of Parkinson’s disease: the muscle rigidity and the tremors. Because the disease affects other parts of the body as well, the researchers also showed the test used in the study for other symptoms. The visitors could test their dexterity, their sense of smell and their colour vision, thus understanding how the brain controls the senses and the movements and why they are affected by Parkinson’s disease. From November 9 to 12, the 2017 edition of the Science Festival, organised by the FNR and the National Museum of Natural History, took place in the Grund and its Abbaye de Neumünster. With more than 50 workshops for both children and adults, the Science Festival attracted a large public. They had the opportunity to discussed with the researchers present at the event and also to take part in various scientific experiments. The National Centre of Excellence in Research on Parkinson's Disease (NCER-PD) was present there with a booth called “Shaken, not stirred!”. 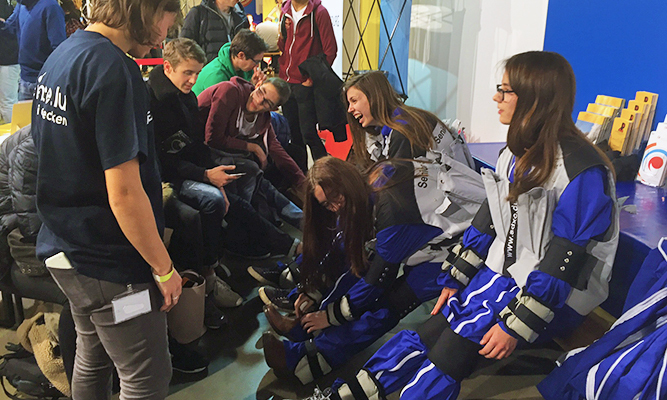 In order to raise awareness about Parkinson's disease and the research activities of the NCER-PD, hundreds of visitors tried on a Parkinson suit which simulates one of the most representative motor symptom of Parkinson’s disease: the muscle rigidity. By placing electrodes on the forearm, one can experiment the other most representative motor symptom: the tremors. Because the disease affects other parts of the body as well, the researchers also showed the test used in the study for other symptoms. The visitors could test their sense of smell, their dexterity and their color vision, thus understanding how the brain controls the senses and the movements and why they are affected by Parkinson’s disease. On 2 September, a Giant Public Pillow Fight took place in Luxembourg in front of the Grand Ducal Palace. The event’s aim was to raise awareness about Parkinson’s disease and the research activities of the National Centre of Excellence in Research on Parkinson’s Disease (NCER-PD). Throughout the afternoon, hundreds of visitors could not only join the pillow fights and buy a piece of Baamkuch, but also visit the stands of the Integrated Biobank of Luxembourg (IBBL), Centre Hospitalier Emile Mayrisch (CHEM), Luxembourg Institute of Health (LIH) and the Scienteens Lab, and learn more about research on Parkinson’s disease in Luxembourg. They could also try on a Parkinson suit ,which simulates the two most representative motor symptoms of Parkinson’s disease: the muscle rigidity and the tremors. Because the disease affects other parts of the body as well, the researchers also showed the test used in the study for other symptoms. The visitors could test their dexterity, their sense of smell and their color vision, thus understanding how the brain controls the senses and the movements and why they are affected by Parkinson’s disease. For two years in a row, on 8 July 2016 and 30 June 2017, the NCER-PD Summer Party hosted NCER-PD participants and their families. The attendants had the opportunity to visit various labs, check out the booths and take home goodies! 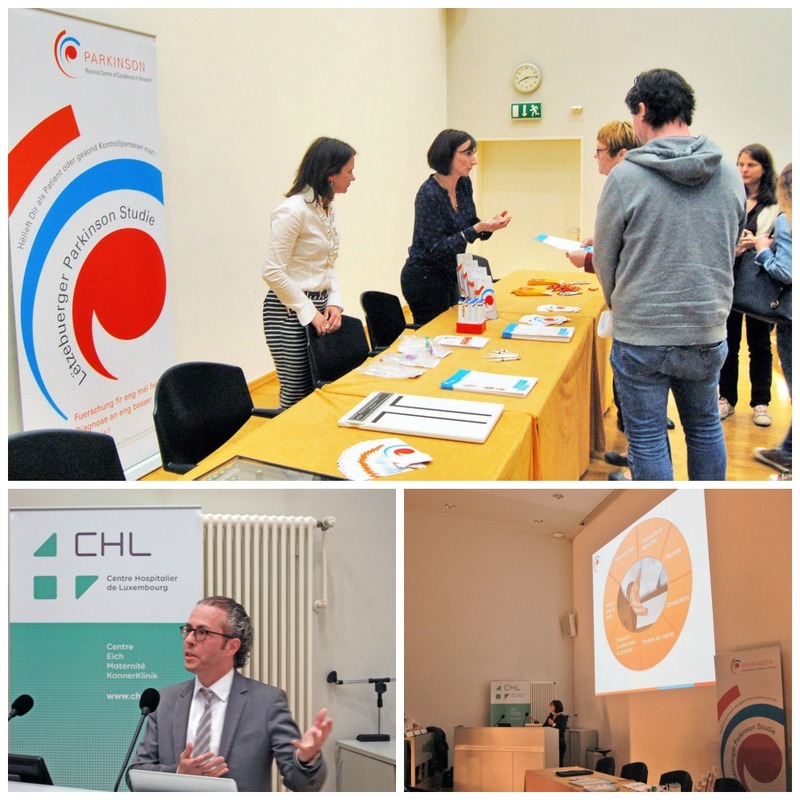 We would to thank the participants as well as our partners (Association Luxembourgeoise des Orthophonistes, Luxembourg Institute of Health, Integrated Biobank of Luxembourg, patients association Parkinson Lëtzebuerg asbl, UniJam) for helping host the event. Each April we celebrate the birthday of James Parkinson, who first described the disease in 1817 as characteristics of Parkinson’s. Patient groups around the world organise the World Parkinson’s Day around the 11th of April, to draw attention to the disease and inform on symptoms and treatment options. The NCER-PD Team was also very busy during the month of April. Thanks to the Flying Team Van, the team participates in different events in Luxembourg and the Greater Region. The team talks about the NCER-PD research through presentations and the information booths. The NCER-PD team participated with a booth at the 2017 edition of the CFL event "Journée Sécurité Santé". The aim of the event was to inform the CFL employees on topics related to health and safety at work. The NCER-PD team had the opportunity to spread information about Parkinson's Disease and the research on it in Luxembourg, as well as to encourage new volunteers to participate in the clinical study. The NCER-PD team participated at the Physiotherapist Day at the Centre Hospitalier de Luxembourg; this event was a great opportunity for the team to develop the collaborations with the physiotherapists in Luxembourg. 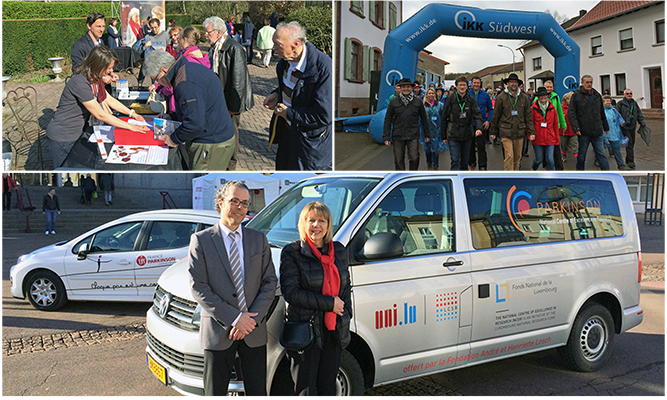 The NCER-PD team participated at the "Physician's day" in Luxembourg City. The aim of the event was to ease the conversation between physicians and patients. The NCER-PD team and AEPU (Association d’enseignement post-universitaire) jointly organised a conference on the topic of Parkinson's disease with the theme "The patientat the centre of research and care". This was a great opportunity to reinforce collaborations with doctors in Luxembourg and the Greater Region. The 2016 edition of the Researchers’ Days, organised by the FNR, attracted a large public that took part in fascinating scientific experiments and had the opportunity to discussed with the researchers present at the event. The NCER-PD was present there with a booth called “What Parkinson’s disease feels like”. In order to see how Parkinson’s disease feels like, hundreds of visitors tried on a Parkinson suit which simulates the two most representative motor symptoms of Parkinson’s disease: the muscle rigidity and the tremors. Because the disease affects other parts of the body as well, the researchers also showed the test used in the study for other symptoms. The visitors could test their dexterity, their sense of smell and their color vision, thus understanding how the brain controls the senses and the movements and why they are affected by Parkinson’s disease. 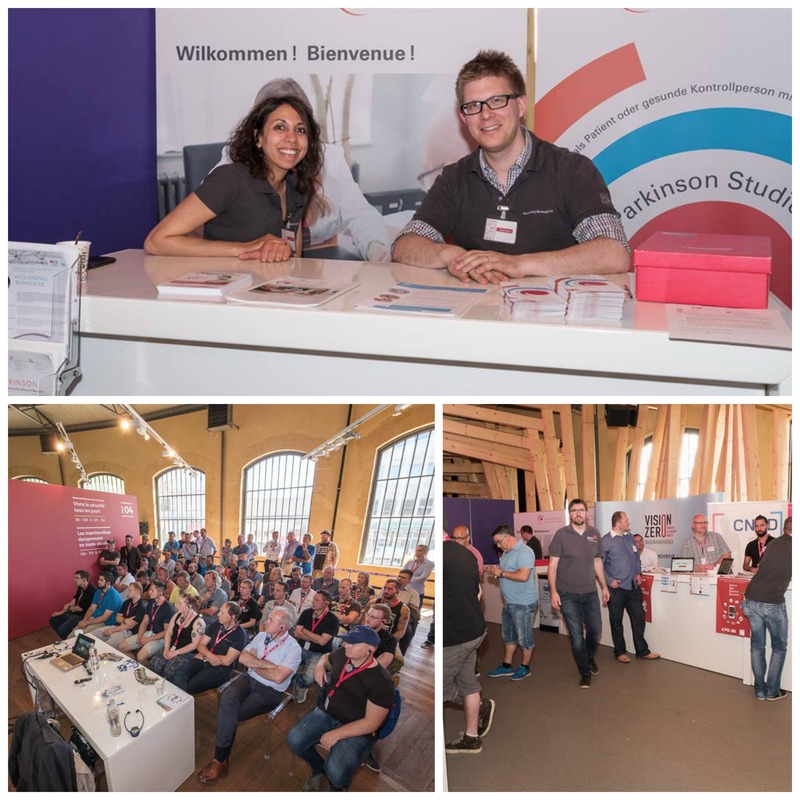 On 4-5 July, the NCER-PD team participated at the Blast Furnaces Festival with an information booth, where visitors can get multilingual information about the study and try out colour vision tests, dexterity tests and a smell test that are part of the clinical characterisation of Parkinson’s patients within the study. On 21 May 2016, the NCER-PD Clinical Team travelled to Trier in Germany where the patient organisation “Jung und Parkinson” hosted their yearly “Movie Day” in a local cinema. The aim of the event was to inform the interested public about Parkinson’s disease (PD) by presentations of leading health professionals as well as by information desks of companies and associations concerned with PD and other movement disorders. Each year around 20th May, the International Clinical Trial’s day celebrates James Lind’s first clinical trial in 1747, which allowed him to develop the theory that citrus fruits cured scurvy. Since then, Clinical Research has been proved essential to generate scientific knowledge and develop new treatments, and is also a privileged way to provide patient access to therapeutic innovation. In 2016, the event raised awareness for the importance of clinical Parkinson’s disease research. The Open Day is an opportunity for prospective students and researchers to find out more information about the study and the research programmes at the University of Luxembourg. The NCER-PD Team was also present with an information booth where visitors can get multilingual information about the study and try out colour vision tests, dexterity tests and a smell test that are part of the clinical characterisation of Parkinson’s patients within the study.